A 34-year-old construction worker fell to his death on Tuesday, March 19, at a construction site in Harish. The man, an unidentified Moldovan national, was the third worker to die this week at a building site in the town located at the western end of Wadi ‘Ara in north-central Israel. 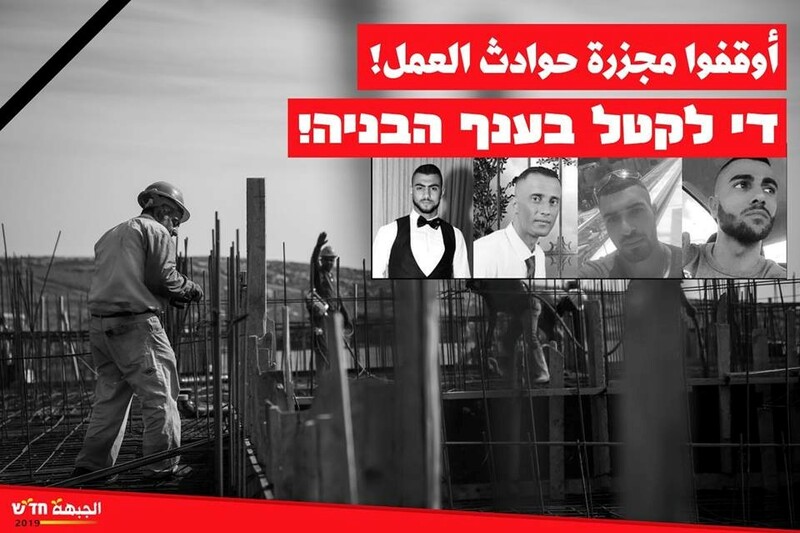 “Stop the slaughter of work accidents!” (Arabic); “Enough death in the construction sector!” (Hebrew) – A poster issued by Hadash following the worksite deaths in recent days; from left to right: Ibrahim Nassim Abdo (19), Fahed Yousuf Ghneimat (38), Damen Joul Tatour (25), Amin Nasser Bsoul (25). The fatality was the fourth in a workplace accident in Israel from the start of this week, the fifth since last Friday, and the tenth since the beginning of 2019. The Stern Construction Company manages the building project in Harish and Hadash labor activists demonstrated yesterday (Wednesday) at the workplace where the accident occurred. The Stern Construction currently manages 22 active construction sites. Five accidents have taken place at the company’s sites, and 17 safety orders have been filed against it, including infractions connected to workers working at dangerous heights without sufficient safety measures, life-threatening electrical defects and defective scaffolding. As long as construction companies are not hit with heavy sanctions for such infractions, those responsible will basically ignore those that are levied against them rendering them meaningless. The Coalition against Construction Site Accidents has been calling on the Labor Ministry to amend the law and give inspectors the authority to close down for extended periods of time construction sites with dire or repeated safety violations. Three other workers were killed and two others were injured in work accidents earlier this week across Israel. Fahed Yousuf Ghneimat, 38, was fatally injured at a factory in the Netivot industrial zone on Sunday and died soon thereafter. The same afternoon, two construction workers, Damen Joul Tatour and Amin Nasser Bsoul (both aged 25), died in Harish after falling from a seven-story building. On Friday of last week, a 19-year-old air-conditioner technician from Nazareth, Ibrahim Nassim Abdo, fell to his death from the third floor of an office building in Dubnow Street in central Tel-Aviv. Hadash activists will be holding a protest demonstration at that site, tomorrow (Friday) at 11:00.